Lapid's party comes in at 21 seats to 26 for Likud. In 1-on-1 vote against Netanyahu, Lapid ties with Bennett for closest gap behind the PM. 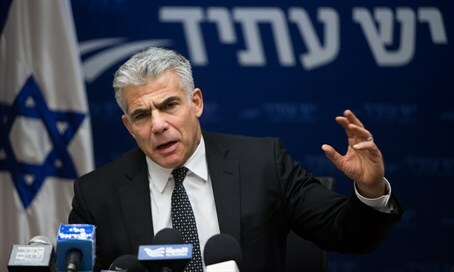 A special poll marking a year since elections was published in Maariv on Friday morning, and indicated that the "centrist" Yesh Atid is nearly catching up to the ruling Likud party. The poll found Likud dropping from 30 mandates down to 26, while Yesh Atid jumped from 11 all the way up to 21, coming within a few seats of Likud. Adding together the results of the parties currently in the coalition finds them dropping from a total of 61 MKs, the bare minimum for a majority coalition, to just 57 MKs. If accurate, the findings would show the current coalition government will not return to power. Most of Yesh Atid's increase appears to have come from Zionist Union, which dropped from 24 mandates to a paltry 15, while Likud's drop may be explained by Jewish Home which rose from eight to 12. Jewish Home would tie with the Arab Joint List, which goes down by one seat from its current tally of 13. Yisrael Beytenu rises from six mandates to nine according to the poll, while Shas stays at seven and United Torah Judaism remains at six. The Kulanu party drops from ten seats down to just six, and Meretz likewise receives six. The poll also asked respondents: "If elections were held in Israel for the Prime Minister and Binyamin Netanyahu ran against each of the (following) candidates, who would you choose?" The closest gap (11%) was seen when Netanyahu was placed against either Yesh Atid chair Yair Lapid or Jewish Home head Naftali Bennett. In Lapid's case the results would be Netanyahu winning 47% to 36% in terms of support, while Bennett comes behind the Prime Minister 40% versus 29%. Former IDF Chief of Staff Gabi Ashkenazi, who has yet to officially launch his political career, would come in with the next closest gap (14%), as results would be 44% versus 30% if he ran against Netanyahu. Opposition head MK Yitzhak Herzog (Zionist Union) is outpaced 56% to 25% according to the poll in a whopping 31% gap, and Yisrael Beytenu head Avigdor Liberman comes in 49% versus 23% in a 26% gap behind Netanyahu.